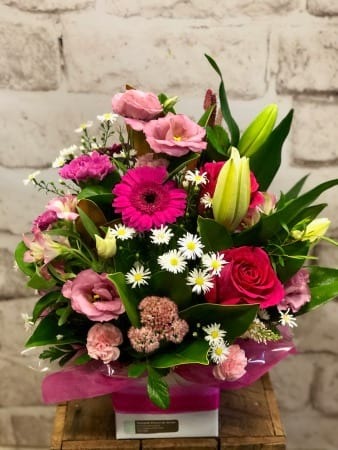 Amaranthine`s Jessica Arrangement is a stylish and long lasting box arrangement that has the classic pink oriental lilies, pink snap dragons, delicate white and pink lisianthus, pink gerberas and a mix of lush green foliage. The Jessica Arrangement comes in it`s own water source box and is perfect for a hospital room or office to say Thank You, I Love You, I Miss You, Happy Anniversary, Happy Birthday, Our Thoughts Are With You or Just Because. Designed by Amaranthine Flowers By Design. Your local florist in New Lambton, Newcastle.